A new electric vehicle charging solution that could lower electricity bills for EV drivers while reducing peak grid demand is being explored by Franklin Energy and Powervault. The solution would provide full Vehicle-to-Grid (V2G) / Vehicle-to-Home (V2H) services, drawing upon Franklin’s experience in EV charging solutions as well as Powervault’s expertise in developing intelligent energy storage systems. 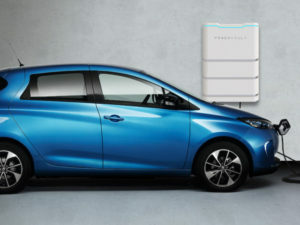 The V2G/V2H charging control system would integrate via the cloud with Powervault’s existing smart home battery product, which incorporates either first or second-life lithium-ion cells supplied by Renault. This would optimise the flow of energy between the home, electric vehicle and across local and national electricity networks. Franklin Energy and Powervault project are currently working on a feasibility study to prove their concept is viable before development of a prototype product is developed.